New Nexus from Google this year will most likely be back to the Nexus 5 and comes in two variants. Here we have a view of the back most likely smaller Nexus 5 2015 from LG's. 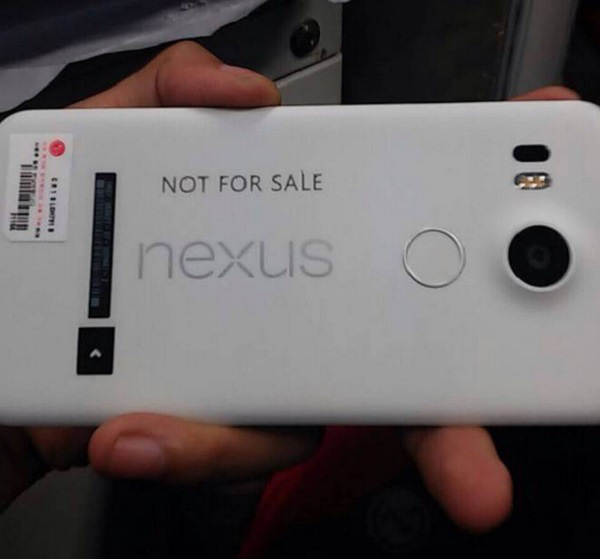 This first live photos allegedly showing the back of a prototype of the Nexus 5, 2015 and reveals again polycarbonate case in white with Nexus logo printed vertically. You will notice that around the camera slightly protrudes out of the case, followed by a dual LED and laser autofocus on the left. There is speculation that it is a 16 MP or 20.7 MP camera. This round under the camera is supposedly a fingerprint sensor, which as we know Android M get native support. The openings do not see the rear speakers, which to some extent confirmed by the speculation that it will on the new Nexus 5, 2015 get a frontal position, which we certainly welcome, especially if it is a stereo speaker that can compete with HTC BoomSound speakers. On a white najljepnici with bar code, to be observed and the LG logo. This is does not look particularly impressive, at least as far as design.